When it's time for vintage style suits, Contempo is where you find them. 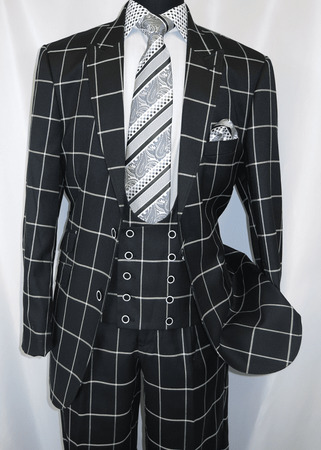 These black square plaid vintage style suit brings back the 1930s style with the big bold square plaid fabric and scoop style vest that is pure vintage in style and attitude. The pants are pleated and the jacket has double vents in the back for easy movement. Made of wool feel poly/rayon.